Baby Aidan is here! Just recently on Twitter, Chelsea Clinton announced the birth of baby Aidan, and the photos of Aidan Clinton Mezvinsky are nothing short of precious. Clinton gave birth to her second child, and the second grandchild of former President Bill Clinton and Democratic presidential candidate Hillary Clinton, on Saturday, June 18. Naturally, and even during this incredibly hectic time for the family, the Clintons are overjoyed at the arrival of the newest member of their clan. Chelsea expressed her happiness via Twitter by stating, "At 7:41 AM Saturday, our family and hearts expanded with Aidan’s arrival. We are blessed." The elder Clintons also took to social media to demonstrate their sheer glee at the sight of a new grandchild. Hillary Clinton accompanied a photograph of herself and Bill with baby Aidan with the words, "What a joy being with our new grandson, Aidan. So grateful. 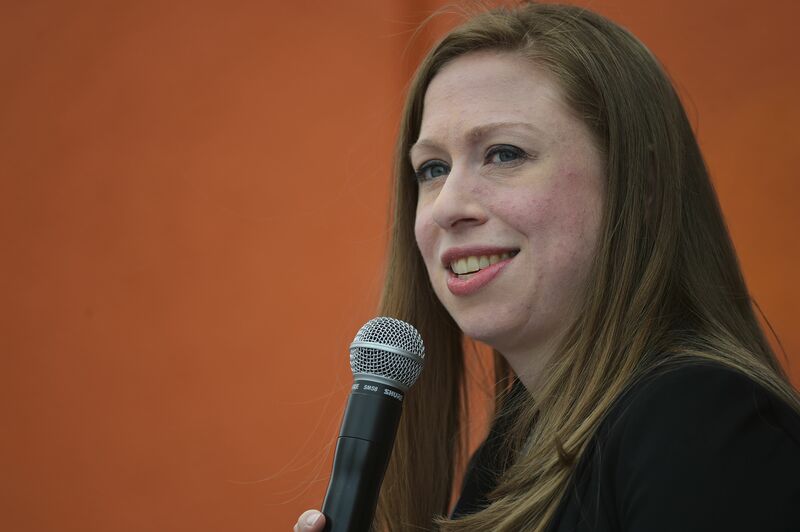 -H." Since the initial announcement on Twitter, a few photos in honor of Father's Day are now on Chelsea's personal Twitter page — one of which features her husband, investment banker and hedge fund executive Marc Mezvinsky, and Bill Clinton holding little Aidan. But first, here's the tweet reveal of baby Aidan. He's already famous, and he has only lived for a day! Hillary Clinton's photo of Bill, baby Aidan, and herself is equally as sweet. Love her or not, everyone can appreciate the love grandparents have for their grandchildren. Likewise, it's refreshing to see Hill and Bill taking a breather from the campaign trail. One cannot live as a politician all the time! Sometimes, a person just needs to have some time as a grandparent. The pair added in a statement, "We are all over the moon as Chelsea and Marc welcome Charlotte’s little brother to the world and grateful for our many blessings. Chelsea and Aidan are both doing well and enjoying this very special time together." In listening to the speeches from the campaign trail, it is abundantly clear that grandmother Hillary Clinton understands not every child will have presidential blood to help them through life. She once said, "You shouldn’t have to be the granddaughter of a former president to be able to live up to your God-given potential in America," and it is so true. Despite her own expected biases toward her two grandchildren, she wants all children to have the opportunities of her own family. Even so, America can't help but anticipate a bright future for both Charlotte and Aidan.